At first glance this letter collection may just seem like trivial tales of an uneventful everyday life - but under the trifling discussions of silk stockings, dinner menus and minor balls lies the heart of the most accomplished writer who ever lived. 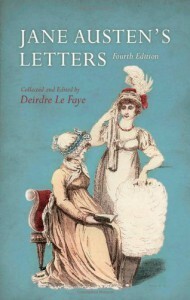 These letters offer intimate insights in Jane Austen's way of thinking, reasoning and living. This book is the most direct impression one could ever gain of Jane Austen herself. And it is fascinating. From the loving, gentle and comforting letters to her sister and relatives, to the formal business correspondence concerning her novels, her endearing childhood rhymes composed for the amusement of her nieces, her harsh and sarcastic portrayals of her surroundings and acquaintances, and the mournful accounts of death and loss; these letters show Jane Austen from as many angles as humanly possible. Of course I delighted in the letters that involved literary criticism and details of her reading material along with her own reflections on the construction of her novels, but I also enjoyed forming a clear picture of her simple everyday life. As I reached the last letters, and finally read Cassandra's grievous account of Jane's death, I felt like I had gotten to know my literary idol a bit better. Because, after all, this is not insignificant letters of an important author; it is touchingly real pieces of a blessed human being.